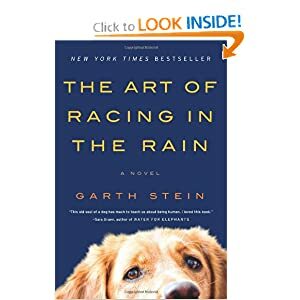 I just read (well, skimmed) The Art of Racing in the Rain. It’s for a new book club I’m visiting next week, so I wanted to like it. I really really wanted to like it so I could participate enthusiastically (!) in the discussion, but I knew I was in trouble by page 7. Wow. Can you say “trite,” “unoriginal,” and “one-dimensional”? No character development. Shoot—no characters! Only stereotypes! Completely predictable, not to mention unbelievable, plot. The whole thing reads like a bad Lifetime movie (apologies, Lifetime). I struggle to see how nearly 2000 ratings on Amazon come up with 4.5 stars. That’s either a comment on the sophistication of the reading public, the success of Garth Stein’s marketing machine, or a whole lot of hope given to those of us still honing our craft. Publishers, you can do better than this! As one reviewer said, it’s a tearjerker that doesn’t “earn” the tears…oy. so, did you join the bookclub? Meeting this week. Will see how the others reacted to the book…!! LOL. I’ve heard that Stein’s first agent actually refused to pitch this book to publishers. If publishers are only publishing trite @#$%, how do we writers know that they’ll be able to ID good stuff when it appears?